A federal judge who has ruled for more than a decade on how to save Columbia and Snake River salmon says four dams on the Lower Snake River should be torn down. 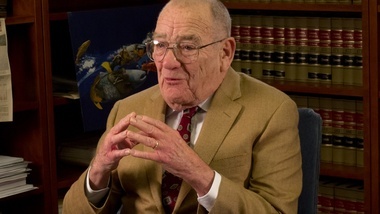 In his first interview since stepping down last year from the case, U.S. District Judge James Redden says the dams in Washington are harmful to the federally protected fish. "I think we need to take those dams down. And I've never ordered them you know - or tried to order them that you've gotta take those dams down. But I have urged them to do some work on those dams...and they have." The Snake River is a tributary of the Columbia. Salmon and steelhead from Idaho must migrate past the dams on their way to the ocean -- and when they return home to spawn. Redden's comments are re-igniting debate over one of the most controversial questions when it comes to saving salmon and steelhead. Environmentalists say dam removal is the best way to ensure fish survival. Many commerce groups are opposed. Only Congress can authorize such action. Although dam removal is politically daunting, Redden says it wouldn't be the biggest challenge people have overcome when managing the river. "Trying to take a down dam is not very difficult. It's a lot easier than putting them up. But even taking one dam would be helpful." Redden is 83. He first took over the Columbia salmon case in 2000. He rejected three presidential administrations' plans to manage the dams and protect fish before turning the case over to another judge in November. Redden says he has no regrets. "I'm happy about what I've done, although I know I haven't done enough. But there's not much a judge can do. But you can raise hell. And I did." Redden granted this interview for a documentary produced by Idaho Public Television. Judge Redden Says Tear Snake River Dams Down <-- Listen at original site.